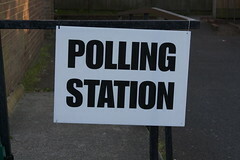 General Election 2010 by poppet with a camera, on Flickr. I’m starting to get seriously annoyed when the polling companies conduct their General Election opinion polls and report the results for England, Scotland and Wales together, e.g., Con 29 (+1), Lab 35, (nc), LD 10 (+1), UKIP 15 (-2), Others 11 (nc). Surely the purpose of an opinion poll is to predict the outcome of the next election, but this doesn’t enable us to do so. It’s completely clear that the two things that are important for predicting May’s election in Scotland is the extent the SNP can take seats from Labour and whether the LibDems will retain any seats outwith Orkney and Shetland. In other words, the only really important figures for a Scottish prediction are SNP, Lab and LD — whether Con and UKIP are up or down is really not likely to make any difference north of the border. However, you cannot work out where the SNP is at from “Others 11” (which conflates the SNP with PC and the Greens and other parties). You can’t even work it out if you look at the regional breakdown in the tables because the sample size for Scotland is almost always too small to give us statistically significant figures. At the same time, including the Scottish figures is likely to make the Tories and UKIP appear less successful than they really are in England, which must distort any predictions made on this basis. Furthermore, it’s completely conceivable that Labour might be dropping like a stone in Scotland while rising gently in England, but these two movements will to some extent cancel each other out. The pollsters have as far as I know always excluded Northern Ireland from their British polls because the party-political system there is completely different. It’s also easy to understand why it made sense to include Scotland in the main polls in the days when the SNP was a minor party and the Tories still had a sizeable following up here. However, it’s becoming increasingly clear that the divergence of Scotland’s political system is here to stay, and the No in the referendum hasn’t changed that at all — if the massive increase in the Yes parties’ membership figures is any guide to such matters it’s likely to become even more different in the years to come. I’m not entirely sure whether Wales should be treated separately from England too, but I cannot see any justification for continuing to conduct political polls for England, Wales and Scotland as one unit. Good post Thomas, I did not realise that Northern Ireland was excluded from UK polls. Given that you make a very good case for excluding Scotland. This would mean that the polling companies would then have to run Scotland only polls in tandem, which I think they would not be inclined to do, partly due to the extra costs. Yet another example of how Scotland is already separate/independent from the rest of the UK. Phyllis Buchanan liked this on Facebook. Jamie Mícheál Hynds-Maloney liked this on Facebook.